Flygt is a world-leader in the design and manufacture of dry and submersible pumps, mixers and related intelligent controls systems. 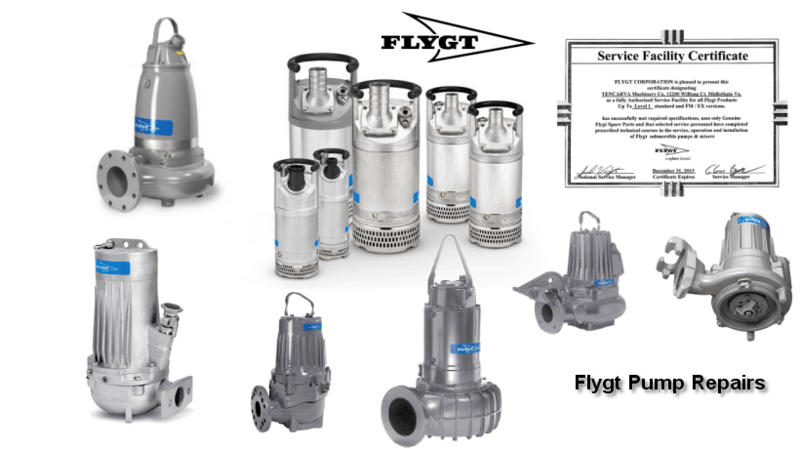 Under the Flygt banner, customers have access to a complete range of products and solutions for moving water, wastewater, and advanced monitoring and control equipment to optimize their use. Product development and manufacturing of Flygt products is based in Sweden. Tencarva Flygt Authorized Repair Service Facility – Virginia – A fully equipped service center with field service trucks that are stocked with parts and material to allow them to make field repairs if possible. We can generally supply a field service technician within 24 hours to your site location. We also have service technicians on 24-hour call, 7 days a week to be able to respond to your service needs. Flygt Repair Facility – Our facilities has full authorization to make warranty repair on your Flygt product, and work with the Regional Service Manager to assure you are getting any warranty credit that may be due you on your Flygt product. If you have your product repaired at a facility that is not a Xylem Water Solutions Flygt Products Authorized Service Facility, the warranty on your product will be null and void.